It's always a good day when I dig through my wool stash and find just the snippet I need! 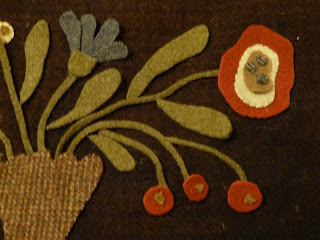 Below is the completed Tulip Sampler Pillow. I changed the colors on a Blackbird Designs piece and then decided I needed to add a wool accent. If I was smart I would have picked the wool first and then keyed the floss colors to match, but luckily it all worked out to my satisfaction. This past week has been a little discouraging as I've been hit by a cold virus that really left me feeling drained. I don't like being home and not feeling up to doing anything, but at least if I have to lay around I have a couple of warm kitties to snuggle with! I enjoyed spending some time catching up on everyone's blogs this weekend. Work has been very busy and it seems like we've had a lot of other commitments as well, but here is a little of what's going on in my little corner. 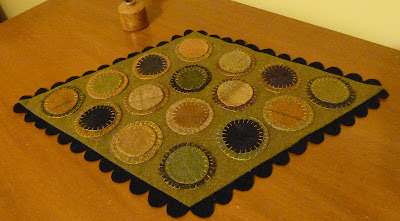 I'm almost done with a little spring sampler pillow that I'll be listing on this month's EWM. - Preheat oven to 350 degrees. Line baking sheets with parchment paper; set aside. - Cream together softened butter and sugars in large mixing bowl. - In a separate bowl, mix together the flours, baking powder and baking soda. Add to liquid mixture along with vanilla and mix well. 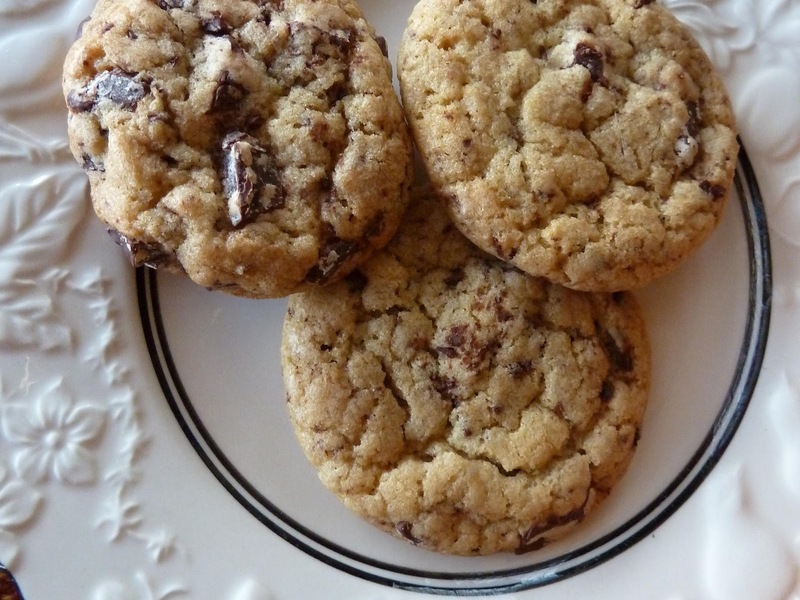 - Stir in chocolate chunks. - Cover with plastic wrap and refrigerate several hours or overnight. This helps the cookies hold their shape and goodness knows we don't want any funky misshappen cookies! We'd have to eat all the mistakes. - Roll cookie dough into uniform sized balls (mine were about 1.5 inches round) and place on prepared cookie sheets. - Bake until lightly browned but still soft--about 13-15 minutes for the size that I made. - Cool slightly on baking sheets before transferring to wire rack and cool completely. I definitely liked the chunks of chocolate and, not being a fan of really sweet things, liked the bite of the bittersweet chocolate. 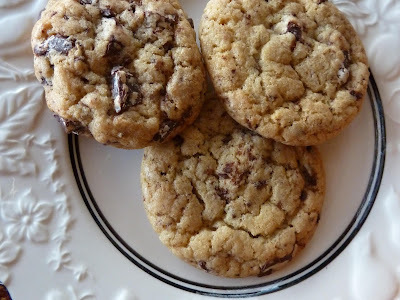 I liked that the cookies maintained their shape, but I have to admit I think I prefer the texture of my Crisco recipe cookies. Signs of spring in the yard--the tulips I planted last fall are starting to break through (as well as the Autumn Joy sedum in the background). Unfortunately the rabbits seem to have noticed them as well so I'm going to go spread some dried blood around them as soon as I finish this post. Will that keep the squirrels away as well? DH painted and installed a new wood floor in my Taj Mahal closet this weekend (the contractor asked him where he's going to keep his clothes). We are waiting for the cabinets to be completed so the entire master bathroom project should be done by the end of next week. Hooray! Simply Primitives has updated for the 15th! If you haven't had a chance to check it out, please hop on over and see what everyone has to offer. My offering for this month was a pillow adapted from a Maggie Bononomi design which is on its way to Connie in Illinois. Thanks, Connie! Between trying to keep up with the dust from our remodeling project and goings on at work my crafting time has been limited for the past month. I hope to be able to reclaim my craft room in another week or so, though! Last Saturday I spent time with 450 church friends packaging Meals of Hope for Malawi, Africa. 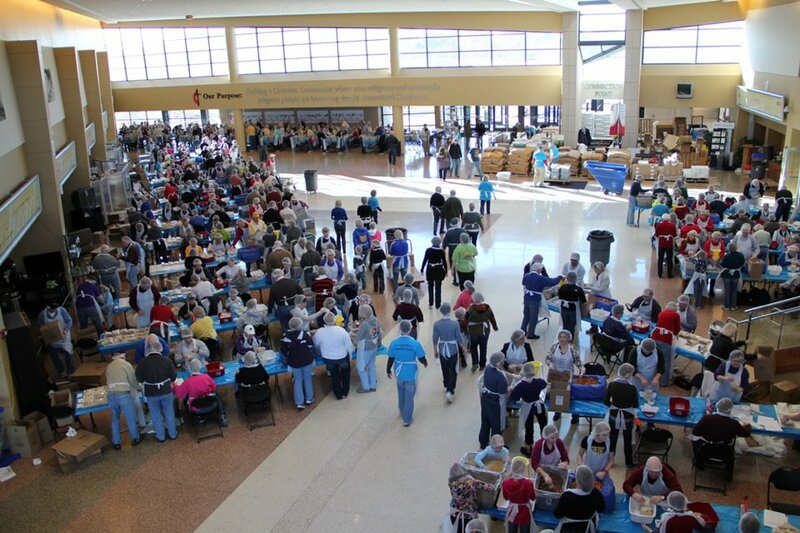 This well organized event was put on by a group from Arkansas. Due to a drought in Africa many will be facing starvation and hopefully these meals and others that will be packed and shipped will help avoid this tragedy. Did you do something special for Valentine's Day? We're staying in and my sweetie is painting away so we can get our remodeling project done---isn't he the best? It wasn't all work today, though. We enjoyed a special treat from Gigi's. Several cupcake bakeries have sprung up in our area over the past few years. 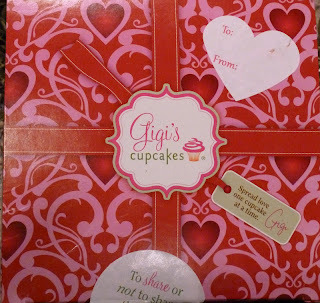 I'm not a real connoisseur of cupcakes so I have to admit Gig's special Valentine's packaging won me over! We're finally getting a little taste of winter here so it's been a good week to try out some new soup recipes. Yesterday I made Cheese & Corn Chowder for a potluck at work and it received rave reviews from my co-workers. This recipe is a little different from most because it doesn't used canned cream style corn, but believe me, it was plenty creamy! Cook bacon in large soup pot on stove until crisp. Remove and drain on paper towel. Pour off bacon fat and wipe out the inside of the pot with another paper towel, then return to burner. Melt butter with oil in same pot, add onion and celery and cook about 7-8 minutes until limp and translucent. Stir in flour, thyme, salt, cayenne and tumeric and cook 2 minutes. Stir in cream cheddar, cream cheese and reserved bacon and simmer until cheese melts, about 5 minutes. (I put the cheeses in about half an hour before serving; then added the Half and Half about 10 minutes before). Don't let the chowder boil or it will curdle. The soup traveled well and I didn't bring any home with me--always a good sign! 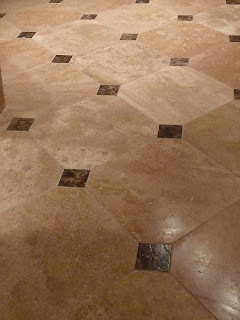 On the home front, the bathroom floor is done! DH and I (mostly DH) will be painting this weekend and hopefully everything will be wrapped up in another two weeks! Labels: Cheese and corn chowder. First of all, I must thank you all for your encouraging words and good thoughts for Cookie. She is eating again and enjoying her little kitty life and we're thankful. Early Work Mercantile updated this week! Lots of new goodies there, just in time for Valentine's Day! Here's a peek at my offerings as well as one that didn't quite get completed on time. I feel a little bit like Dorothy this week, but instead of clicking my heels and chanting "There's no place like home" I'm saying "The dust will be gone. The dust will be gone". The bad part of remodeling is coming home to a new layer of dust every night. But I'm not complaining. Okay, I kind of am, but I know it will all be worthwhile when it's all done, probably in another three weeks. Foxy has enjoyed checking out their progress every day, especially when it involves rolling in red chalk dust.